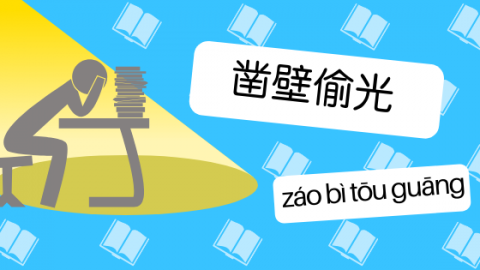 Blog Learn Chinese Chengyu Stories: What does Dig a Hole in the Wall to Steal Light mean? 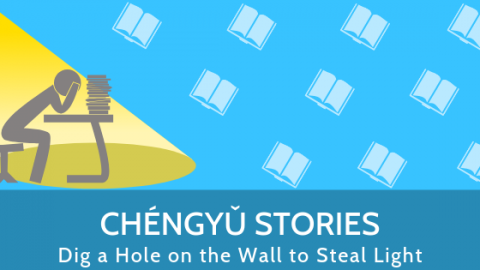 Chengyu Stories: What does Dig a Hole in the Wall to Steal Light mean? When learning Mandarin Chinese, students run into several 4 characters based set phrases called 成语 chéngyǔ. These idiomatic expressions have a figurative, or sometimes literal, meaning, allude to a story or historical quote and are still commonly used in the written and spoken language today. If you really want to sound fluent in Chinese, nothing really beats the impact of using a Chinese chéngyǔ placed in its proper context with a native speaker. Every foreigner can mention “马马虎虎 ” (mǎmǎhūhū) or 对牛弹琴 (duìniú tánqín), but if you really want to impress your Chinese interlocutors, learn another easy to remember and popular idiom, such as “Dig a Hole in the Wall to Steal Light”. 凿壁偷光 Záo bì tōu guāng “to dig a hole (凿)in the wall(壁) to steal(偷) light(光)”. It refers to someone who has the spirit of perseverance in the face of adversity. Do you know the story behind this Chengyu? During the 漢 Han Dynasty, there was a student named 匡衡 Kuang Heng. His family was so poor that they could not afford a lamp oil nor light many candles, but these financial constraints never stopped the young boy for pursuing his passion for reading and studying. Being strongly motivated to pass the imperial exams selecting court officials, Kuang Heng endeavored to find a solution: One night he noticed some light seeping from a crack in the wall which separated his house from the neighbour’s one. Therefore, he dug a hole in the wall to make use of the neighbour’s light for reading. Thanks to the light coming through the wall Kuang Heng studied Confucian texts for years and prepared for the exams. Year by year, he passed each level, impressed the officials, and achieved his dream of becoming an imperial officer. Over the years, he held many prestigious titles till he finally became Chancellor. How and when to use this chéngyǔ? Xiànzài rénmen yībān yòng záo bì tōu guāng lái xíngróng qínxué kǔ dú. Nowadays people use this chengyu to describe someone who studies or works very hard.